SME lending under the Funding for Lending Scheme continues to follow a downward track. The Bank of England publishes quarterly updates on the numbers behind the FLS scheme –releasing the Q3 iteration this morning. Net lending to small businesses by FLS Extension participants came out as -£128m. Whilst this number represents a less severe decline than in previous quarters, it’s bad news once again for the nation’s small businesses. On the flip side, the SME-facing alternative finance providers continue to thrive. In fact, this is the first time that the cumulative lending total of the UK’s peer-to-business lenders and online invoice financiers has been larger than the quarterly decline in FLS net lending. 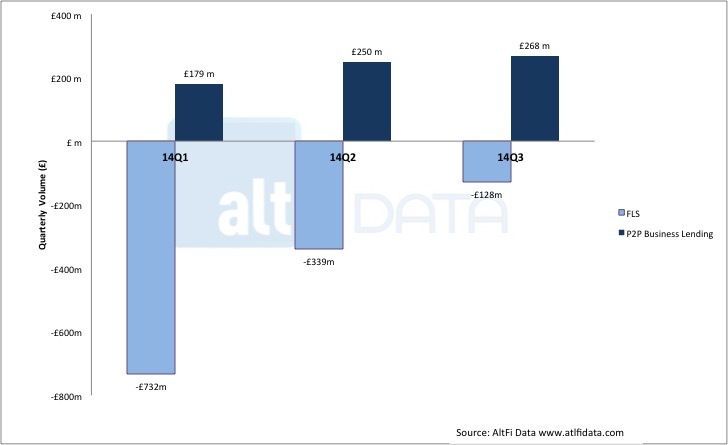 According to AltFi Data, alternative business funders channeled £268m of SME funding over the course of Q3. In other words, alternative finance providers have now scaled to a point where they are not only addressing the SME funding gap, they are closing it. Indeed, alternative lenders not only filled the FLS void in Q3, they in fact provided small businesses with an extra £140m after the fall off in traditional lending activity had been accounted for. “Funding for Lending is still not helping enough small businesses access finance. Net lending is flat and 86% of small businesses that use the Funding Circle marketplace believe the scheme is not working for them*. “More banks are not the answer. Online marketplaces add diversity to an old system badly in need of modernisation and provide a better service to small businesses." 95% of small businesses want to see more collaboration between Government and the financial services industry to ensure that they can easily access finance. 97% of small businesses believe the Government needs to do more to ensure businesses can easily access finance. 55% of small businesses back George Osborne’s proposal to require banks to refer all SMEs that they are unable to help with funding to alternative finance providers.